In 1856 Chicago ( Illinois) began to build sewers that discharged into the Chicago River and Lake Michigan . In 1970, a team of engineers from the District, the City of Chicago, Cook County and State agencies considered various plans to solve the problem of flooding and water pollution. Under this plan, 109 miles of huge underground tunnels would be burrowed under the city to intercept combined sewer overflow and convey it to large storage reservoirs. The mainstream tunnel is 35 feet in diameter, bored in limestone rock 240 to 350 feet below ground, and holds one billion gallons of water. 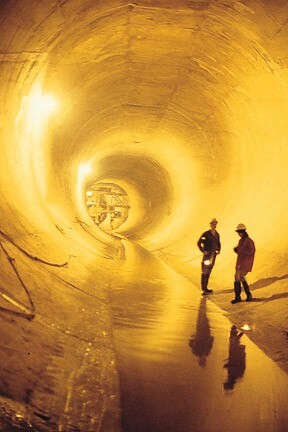 By 2004, The Chicago Tunnels and Reservoir Plan (TARP) expects to complete 175 km (109 miles) of tunnels.